Patio covers are available in Aluminum, Glass or Acrylic. We offer smooth style fascias (perimeter) for a cleaner look which can be color matched to your fascia board. We have various sizes of I-Beams and Posts to accomplish different types of designs and desires. All of our products are fully engineered to meet or exceed all building codes across North America. We offer two styles of insulated roofs as Patio or Deck Covers that can be enclosed at a later date to use as a Sunroom for additional living space. Skylights of various types, styles and materials are available for all of our Patio and Deck Covers, as well as full glass or acrylic roofs. 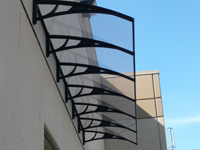 The patio covers were designed to go with our railing systems so they blend seamlessly with each other. All of our products are fully guaranteed.